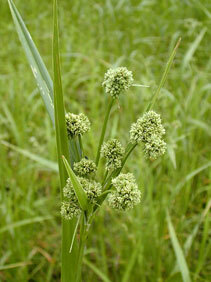 Also Called: Dark green bulrush, gray-head bulrush. Culms: Erect, solitary or several, slender, somewhat 3-sided. Leaves: Blades 4-9, mostly on lower 1/2 of culms, well-developed, to 4/5 inch wide, dark green; margins rough; lower leaf blades and sheaths cross-partitioned. Inflorescences: Panicle-like, open or compact, usually twice-branched, terminal, consisting of dense, nearly spherical clusters of 8-20 spikelets borne at ends of rays; bracts several, leaf-like, often exceeding inflorescences. Spikelets: Egg-shaped, brown, less than 1/2 inch long; flowers perfect; scales elliptic, dark green, turning brownish black or lead-gray with age; tips abruptly short-pointed; bristles 6, at bases of flowers, barbed, shorter than or slightly longer than achenes; stamens 3; styles 3-cleft. Fruits: Achenes, egg-shaped, flattened to 3-angled, pale brown, 1-seeded. Habitat: Marshes, wet meadows, ditches, and stream edges. Uses: Native Americans and pioneers used the roots for food. Waterfowl eat the seeds. Comments: When mature, the inflorescences shatter if the plant is disturbed, scattering the achenes.